Nike was a goddess from the ancient Greek pantheon, and although not one of the major deities, Nike was still an important figure who represented Victory to the ancient Greeks. The goddess Nike was the daughter of the second generation Titan Pallas, Pallas was the early Greek god of Battle, and the Oceanid Styx. Thus Nike was also sibling to Zelos (Zeal), Bia (Force) and Cratus (Strength). Nike’s name means Victory, and the Roman equivalent of Nike was Victoria. ​As the Greek goddess of Victory, Nike was closely associated with athletics and other contests, as well as warfare. Thus Nike was normally depicted as a beautiful woman, with a lyre in hand, to celebrate victory, a wreath, to crown a victor, and a bowl and cup for libations to honour the gods. To this end, the name of Nike was invoked by successful contestants as well as victorious generals. Arguably the most famous tale of Nike in Greek mythology comes early in the story of Zeus; a time when Zeus was seeking to usurp the power of his father Cronus and the other Titans. Zeus sent word out to all the deities calling for allies, with promises of honour and power for those who joined him, but those who opposed him would lose their positions and power. Styx was the first goddess to side with Zeus, and the Oceanid brought with her, her four children, who Nike, Zelus, Bia and Cratus, who also willingly joined the forces of Mount Olympus. During the subsequent war, the Titanomachy, Nike would act as the charioteer of Zeus, guiding controlling his horses and chariot through the battlefields. Of course, the goddess of Victory proved to be on the winning side, and Zeus took the mantle of supreme deity from his father. The assistance given by Nike and her siblings would see them honour by a permanent residence on Mount Olympus near to Zeus, where the four acted as guardians of the very throne of Zeus. 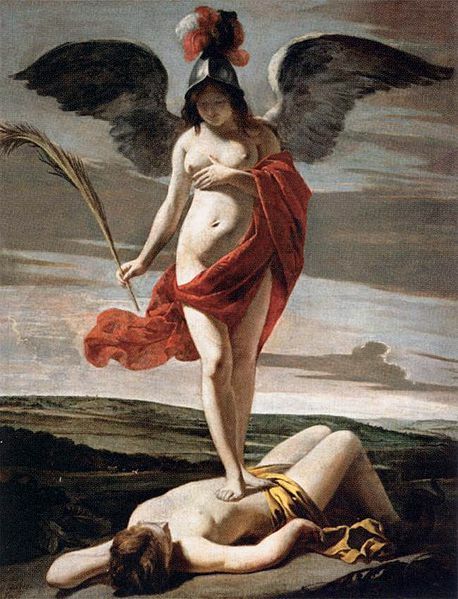 Subsequently Nike would reprise her role as the charioteer of Zeus during the Gigantomachy, the war of the Giants, and also during the uprising of Typhon. The uprising of Typhon would see the monstrous Typhon threaten the existence of Mount Olympus, and all the Greek gods and goddesses, bar Zeus and Nike, would flee from the threat. Nike would offer words of comfort to Zeus, and rally him in his fight with Typhon, and fight that Zeus would of course eventually win. 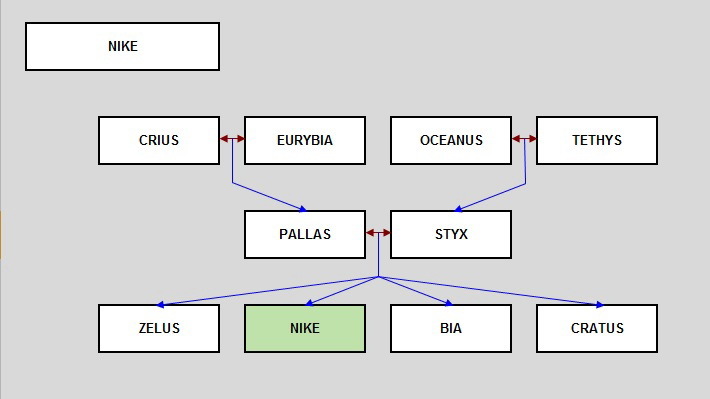 After the wars, Nike was often connected with Athena, the Greek goddess of wisdom and war strategy. In antiquity, depictions of Nike abound, for the goddess was to be found on a wide range of coins, and in addition, statues to the goddess Nike were often constructed to commemorate victories in battles, as with the statue The Winged Nike of Samothrace. Even in the 20th century the use of Nike on statues continued for the Greek goddess was sculpted as part of the original Jules Rimet trophy for football’s world cup. Today, the imagery of the goddess Nike, and her name live on. 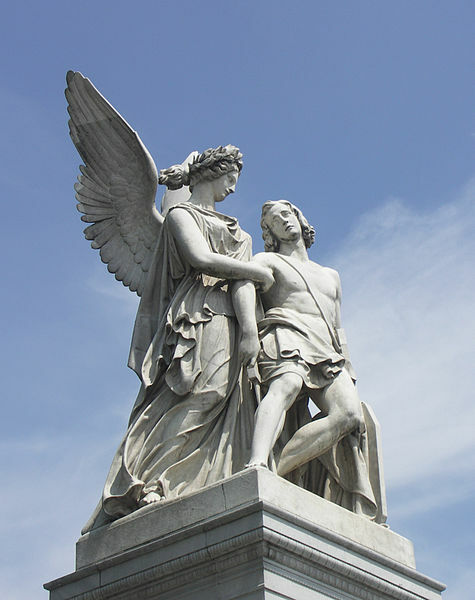 Obviously there is the sportswear brand named for Nike, but also many statues of Nike (in her Roman guise of Victoria) are still visible, including those on top of the Brandenburg Gate and the Arc de Triomphe du Carrousel.